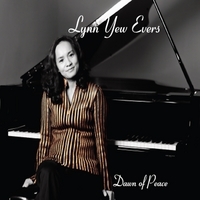 From the very first minute I knew I was going to like the music of Lynn Yew Evers. I could hear Erik Satie in the background of the very first cut of Dawn of Peace. Since I believe that impressionist music fostered the era of New Age I cannot fault Lynn's source of inspiration. Her solo piano compositions are all her own making and her use of nimble phrasing allows her works to have movement and light flow. No somberness here. Lynn's music is anchored in everyday occurrences; the sunrise, a flowing river or a memory frozen in time. Overall, the pseudo-contemporary music has a romantic touch and poetic resonance that seems to have nothing but smooth edges. The first tune, Yew and I, is a wave to the Satie school of music, but the modern tune takes on a very tender life of its own. Lynn uses a delicate touch to introduce her music and it is very soothing like a gentle caress from a soft hand. The song has balance as if Lynn is suggesting the true balance of her life is made up of music and faith. I could not deny the classical nuances in the song Lyrical Mood. The sound is one that is deeply rooted in the Old World, perhaps somewhere in Paris. There is a reflection from the sun as it sparkles on the Seine and the air is warm with summer's promise. This is not a day for stodgy museums and such, but a little known cafe for two, a walk arm in arm along the river and an afternoon of romance. Ah, Paris! Dawn of Peace, the title tune is a tale for musing. It sustains a Gershwin-esque melody that is quite remarkable. Although the tune lacks any resemblance from the jazz of contemporary practices, the phrasing is from another time and another place reminiscent of the tunes that were famous in the 20s and 30s in American popular music. The music however represents one revolution of our humble planet, a sunrise, a beginning that we look forward to full of promise. It is a gentle nudge that offers the expectation of only good things. I always though thought that when God decided to make the color yellow, he created the daffodil first. There is not a more brilliant color in the spectrum. When I heard Lynn's composition Shade of a Torn Daffodil it made me sad in a way. As the music played I was reminded of the purpose of the daffodil, the symbol of purity. The melody made me think of a day with skies with layers of clouds the color of pewter. There is a wind that is unrelenting and then there is the flower that has perhaps fulfilled its destiny to bring beauty into the world and that has fallen to the whims of nature. A Fleeting Moment has the sound of memories from way back when. The structure of the melody has an old timey feel, like a 1940s-50s piano tune and I am led to believe that perhaps Ms. Evers has an anachronistic soul. She is not wrong for the times, only rooted in times when strife could be forgotten for a few moments and the everyday could be savored. How her tiny figures could play at six years old is beyond me, but that is her story. Her roots are decidedly classical, but her music consistently crosses the contemporary genres. She has won a multitude of competitions, performed for royalty, and she has been a composer and arranger for many years. Her best gift however is translation. She translates the romance and history of the past into music that we contemporaries can understand just by listening with our hearts.